August was filled with studying and working on my dissertation, so not that much makeup if I'm honest - my skin probably thanks me. So without further ado, here are my monthly favorites. So, not much makeup. As to not scare people I use Garnier Caffeine Anti-Dark Circles 2-in-1 Roll On - that's a mouthful (£6.99). Doesn't cover everything, yet enough to diminish the zombie-ness. The upside of studying: moisturize all day. Strawberry Body Butter from The Body Shop (£13.00) just smells divine. 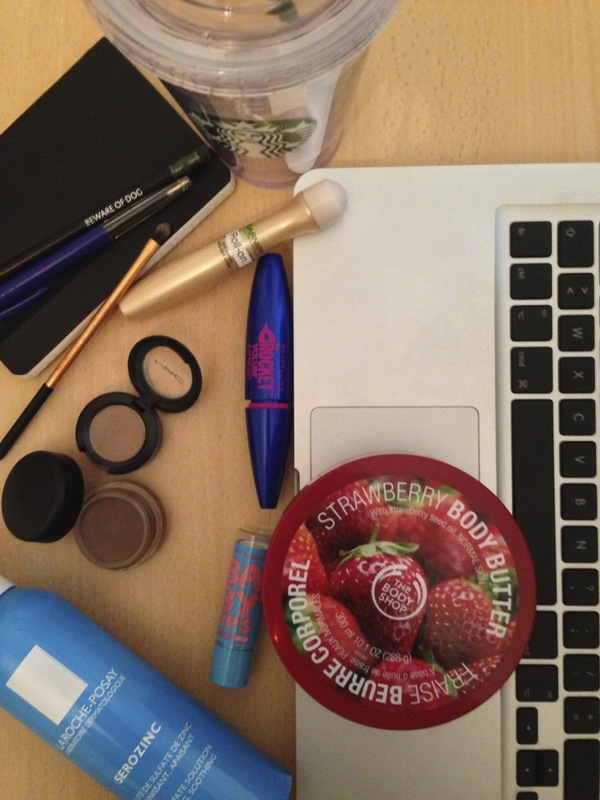 Maybelline Baby Lips in Quenched (£2.99) is also on my desk at all times. The last product is a Caroline Hirons inspired purchase: La Roche-Posay Serozinc (+/- £10.00), unfortunately not available everywhere. You sweep this zinc sulphate solution across your face with a cotton pad after cleanser and before moisturizer. It is anti-bacterial and really removes every little bit of dirt that's left on your skin. It also has a very cooling effect. The other bits on my desk are my Macbook, Moleskine Weekly Notebook (£12.50) and travel souvenirs. I always buy souvenirs that I'll use a lot back home. The pencil on my notebook is my favorite pencil; I got it at a hotel in LA back in 2009. The Starbucks cup (£9.95) I got last year on a perfect trip to London with my best friend.